My name is Dax and I am a cynic. I do not trust people, and I really do not trust corporations. I do not trust newspapers or TV, in fact I don’t trust most media. I guess if I think about it, I don’t trust people much too. Some people tell me I’m a cynic, as if it’s a bad thing. I’m quite happy being a cynic; the sad thing is that I’m seldom wrong. What I like about it is that I am never disappointed, but on the odd occasion I am pleasantly surprised. This book should be read by everyone, and once everyone has read it I think there will be a lot more cynics around. We seem eager to buy and buy into all sorts of products, remedies and theories. Magazines and newspapers are forever telling us about some new ‘development’ and we assume the science behind it is 100% because they wouldn’t lie. They may not be lying, but they are often stretching the truth or even twisting it. Do you recognise any of these topics? These along with many others are dealt with in this book. To take one as an example, we are told over and over that we must take in antioxidants to fight the free radicals that cause cancer. Many products proudly boast that they contain antioxidants too. Ben Goldacre shows that the scientific studies have found no benefits from taking in antioxidants and that in fact they could be bad for us. The point of the whole book is to demonstrate how science is twisted and misquoted by companies and the media so they can sell us something. Some of it has alternate benefits, for instance homeopathy can have a strong placebo effect. While others can be downright dangerous for instance the scare regarding MMR vaccinations which has subsequently raised the occurrence of these diseases due to people not being vaccinated. 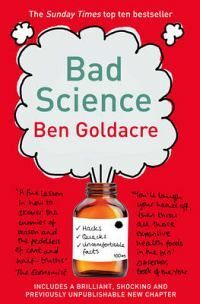 Bad Science is really a very interesting book and it’s time we started to be more savvy so that we can actually invest in and develop good, sound, scientific solutions to problems instead of wasting our money and time on quacks and quack therapies. Do yourself a favour, get a copy of this book and read it. You will not regret it. Having red your review of Bad Science and glanced at the other books that you have reviewed, I suspect that you will enjoy (and approve of) Influence – The Psychology of Persuasion written by Robert Cialdini. Like Bad Science it aims at getting us to think. It succeeds admirably. Two useful links are: http://en.wikipedia.org/wiki/Robert_Cialdini and http://www.amazon.com/Influence-Psychology-Persuasion-Robert-Cialdini/dp/0688128165. Hey Leon, that does look like an interesting book. I’ve added it to my Kalahari.net wishlist and will order it when it’s next on sale!